In some cases you may want to pause or inactivate an exercise. For example, if you prescribe an exercise but the patient finds it too difficult or painful you may want to pause the exercise until their tolerance improves. With most exercise software you need to remove the exercise from the patient’s program. But in many cases it is easier to simply pause the exercise so it is not visible to the patient – but so you can still see it in their exercise list. By pausing/inactivating the exercise you can then easily activate it for the patient when they are ready. This saves a few steps (and valuable time) as you do not need to go search for the exercise and then re-prescribe it to the patient again. This option to pause/inactivate an exercise can also be helpful when planning future exercises. For example, you may plan on progressing a patient through a certain group of exercise progression or a specific exercise tract over time, but the patient may not be ready to be prescribed all of the exercises at one. An easy option to to prescribe a group of exercises but then pause/inactivate the exercises your patient is not ready for yet. This will save you time later when you want to progress the exercise program as you simply need to activate the paused exercise instead of searching for and then prescribing the exercise. 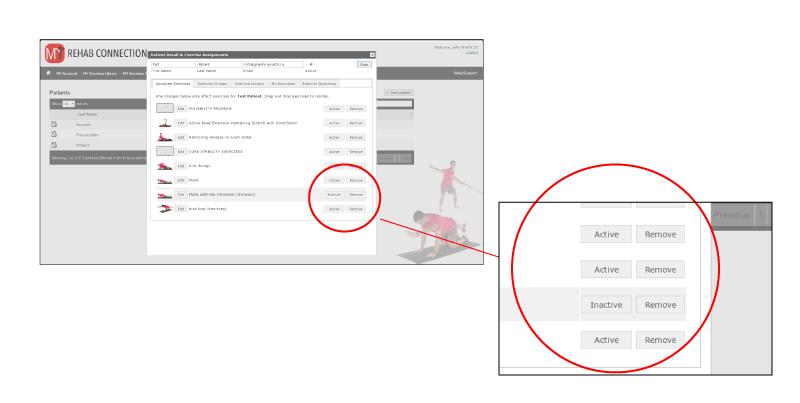 To pause an exercise simply click on the ‘Active’ button to the right of the exercise name within the ‘Assigned Exercises’ of the patient window. (Note: By default the exercises are ‘Active’ when first assigned to the patient). As you click the ‘Active‘ button it will switch to ‘Inactive‘ and the exercise will become grey – indicating that it is now inactive. The click ‘Save‘. **Only active exercises will show up on the patients MY Exercises section on their app. And only active exercises will be displayed within the Exercise Summary tab, as this is the text list of the patients current exercise program for your SOAP notes.